You're going to find that you do a lot of studying in college at coffee shops or in a dorm common room. You don't want to carry your pens, highlighters, and notebooks in your hands on your way to either place. You may get to your destination just to find that you lost some of what you were carrying along the way. As you're adding college supplies to your college dorm checklist, make sure you have a backpack such as our Quatrefoil Grey and Pink College Backpack. This dorm necessities item has a front compartment that will keep your highlighters and writing utensils separated from your notebook so you don't lose them. With a spacious main compartment, you can make carrying your notebook and ereader or tablet more convenient. Our Quatrefoil Grey and Pink College Backpack isn't just great for study sessions - it also has a great look! 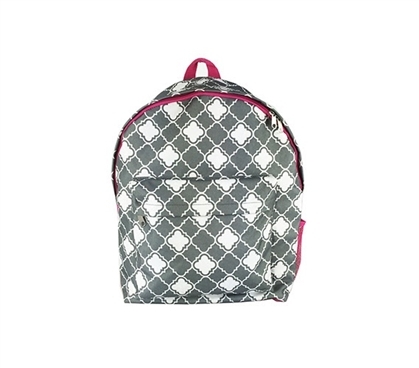 With a cool looking grey and white pattern with pink trim, you will also have a stylish dorm backpack. You can even pack up this dorm item for weekend trips to visit your friends and family!